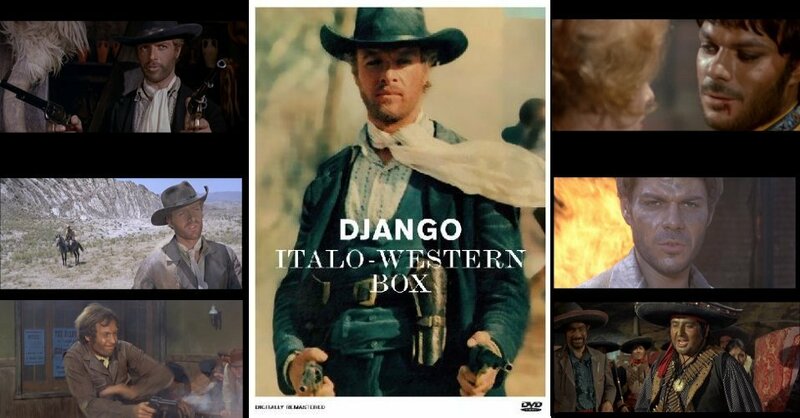 3 film, 4 disc collection of Spaghetti Westerns featuring Django. Koch Media R2 German boxset. With all the attention lavished on Sergio Leone's Spaghetti Western trilogy, some people might think that they are the only titles in the genre - but in a decade of Italian Westerns there were over 500 films produced. One name that cropped up more than any actor, director or producer was Django. The eponymous anti-hero, made famous by Sergio Corbucci's 1966 film was often dubbed into titles by German distributors and this set provides examples of one original Django film and two films where the lead character was christened as such for the German release. The first two films, Per 100,000 Dollari ti Ammazzo and 10.000 Dollari per un Massacro were produced by exploitation masters Luciano and Sergio Martino and featured the up and coming euro-cult star Gianni Garko alongside the tragically short-lived Claudio Camaso. Relatively minor genre entries they are both very impressive and rank as some of the best Spaghetti Westerns ever films. Execution is a later, seperate film starring the British actor John Richardson that is distinctly less impressive in every respect. Anyone famous involved? Cult Euro-Western actor Gianni Garko stars in the first two films, while British actor John Richardson appears in Execution. Who is it for? The two Gianni Garko titles in this set are highly recommended to Spaghetti Western fans, while Execution is a pallid affair in comparison, but might prove interesting. Visuals All films are in Original Aspect Ratios (2.35:1 and 1.78:1) and Anamorphically Enhanced. Audio All discs have Italian and German mono soundtracks that sound fine. The German tracks are missing in a few scenes, replaced by Italian. Subtitles All the discs include German subtitles for the Italian tracks and English subtitles for the Italian tracks. All of the discs include theatrical trailers and brief poster galleries. Split across the two discs containing Gianni Garko films is a 50 minute documentary Mondo Garko, which includes a lengthy interview with the actor about his Spaghetti Western career, as well as footage from his various films. Very interesting. Presented in Italian, with German or English subtitles. The boxset includes an Audio CD containing the Nora Orlandi original soundtracks to the first two films. Sound quality is very good. The boxset also includes a detailed booklet about the Django films, all in German. Packaging A fold-out digipack contained in a slipcase. Availability All three films are only available within this boxset. Other regions? The Martino titles are also available elsewhere, but not with English options. Cuts? All films are believed to be fully uncut. Prints are Italian langauge. A duo of real Spaghetti Western gems and a very poor entry. A great looking set of prints with good audio and flawless subtitles. The interview feature is extensive, and subtitled in English and the soundtrack CD is superb. The only slight downside, for some, is the absence of English dubs, otherwise this set is perfect and unlikely to be bettered. All text in this review written by Timothy Young - February 2007.